What if he’s crazy, or angry or not trustworthy? Is collaborative approach to divorce possible or advisable? In my practice I have heard certain accusations repeatedly for 24 years, clients telling me that their spouse is “crazy”, “a narcissist”, “controlling” , “hiding money” and/or “cheating”. h in most instances. The reason is that the collaborative model is better able to cope with mental illness, personality disorders, anger, sadness and fear. The collaborative model has a mental health provider that serves as a facilitator or coach to help us through the process. The team (2 lawyers, mental health professional and financial professional) in a collaborative case can guide the process to accommodate special needs and issues that the couple may have. The full disclosure of information committed to and required by the collaborative process helps people to deal with the distrust that exists when going through a divorce. The neutral lens and voice of the neutral financial professional helps to even the playing field in collaborative cases. Interest based negotiations allows us to find value in areas that the court model does not which increases settlement satisfaction. 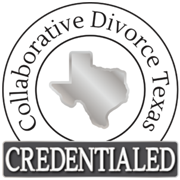 Check it out www.collaborativedivorcedallas.net.